Ten of our best selling images now available in open edition framed canvas prints. Each canvas is hand stretched and framed, ready to hang complete with a nameplate. The Series is made up of Mark Keathley's most popular images, these Minis are reproduced on paper and then transferred to a cotton fiber canvas. 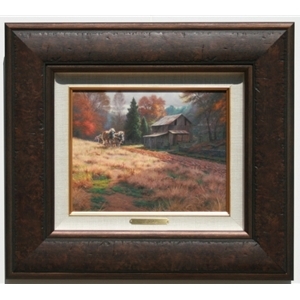 Each canvas is then framed in a special 3" Davinci Mocha frame with a 2 1/4" linen liner. A brass nameplate is added to the linen liner giving these Minis a very elegant look. This Mini has been discontinued.